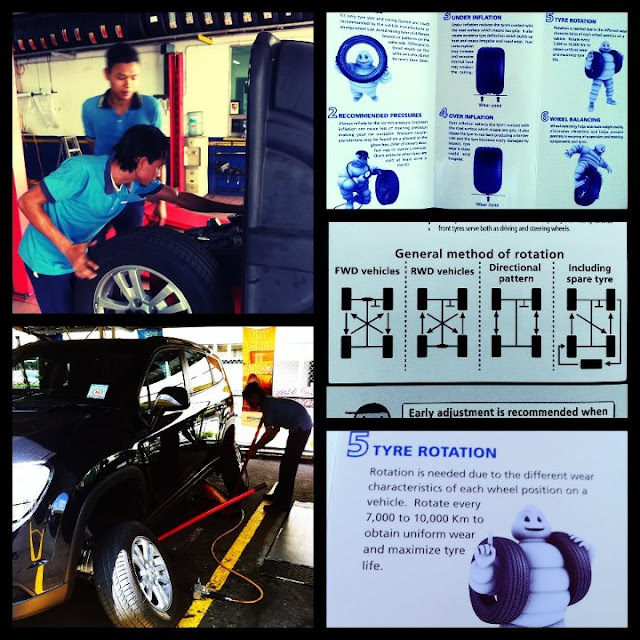 Today me went to do my car tyre rotation at Sin Hup Huat. At first I want to wash the car one... but sekali the sky dark dark and raining so no jadi. Then I see my car mileage already over 10k baru I remember someone ever told me tyre have to do rotation every 7 to 10k. After I do the rotation now the car drive like new car as the 1st day I bought it!!! More silence and smoother.... I like it. Just a small simple trick and can make the car drive better and the life spend longer for the tyre.... just pay few dollars it totally worth it lah!!! so when is the last time you did your tyre rotation??? I know there are many people don't think rotating the tyre are important.... just pakai until botak then change the new set lah.... Right!!!! Me last time also like that but now no more after I become a father... Now everything also think of Safety for my family!! !